Saito, Hanae / Chu, Stephen J. / Zamzok, Jonathan / Brown, Marion / Smith, Richard / Sarnachiaro, Guido / Hochman, Mark / Fletcher, Paul / Reynolds, Mark A. / Tarnow, Dennis P.
This paper presents the results of a prospective study on the clinical effect of grafting the buccal gap with platform switching, following flapless tooth extraction and immediate implant placement and provisional restoration, on (1) alterations in buccolingual ridge dimension and (2) midfacial peri-implant soft tissue thickness. Fifty-six patients were placed in one of four treatment groups: (1) a non-platform-switching implant (Non-PS, n = 14); (2) a non-platform-switching implant and bone graft (BG/Non-PS, n = 14); (3) a platform-switching implant (PS, n = 15); and (4) a platform-switching implant and bone graft (BG/PS, n = 13). Buccolingual ridge dimensional change and peri-implant soft tissue thickness at 2 mm below the free gingival margin were measured. Both PS and BG/PS groups showed an increase in buccolingual dimension compared to the contralateral natural tooth site as well as peri-implant soft tissue thickness of > 2.5 mm, clinically. Platform switching was associated with significantly greater midfacial soft tissue thickness than bone grafting (mean ± standard deviation: 2.17 ± 0.04 for Non-PS and 3.55 ± 0.14 for PS). Using platform-switched implants, in conjunction with immediate implant placement and immediate provisional restoration, was associated with a significantly greater stability of ridge dimension and peri-implant soft tissue thickness than using non-platform-switched implants when measured 12 months after placement of the final restoration. Platform switching may help achieve preservation of ridge dimension and enhance the stability of peri-implant soft tissue following immediate implant placement and provisional restoration without bone grafting. Further research is required to assess the long-term outcome. Chu, Stephen J. / Östman, Pär-Olov / Nicolopoulos, Costa / Yuvanoglu, Petros / Chow, James / Nevins, Myron / Tarnow, Dennis P.
A prospective cohort clinical study was performed to evaluate the concept and design of a novel macro hybrid implant placed into maxillary anterior postextraction sockets. Thirty-three patients with an equal number of hybrid implants were used to replace nonrestorable single anterior teeth with immediate tooth replacement therapy (immediate implant placement and immediate provisional restoration). The macro features of this hybrid implant are unique in geometry, as it combines two different shapes-a cylindrical coronal and tapered apical portion-into a singular body design, each comprising roughly half of the implant length. The hybrid design of this platform-switched implant also has a subcrestal angle correction, or Co-Axis feature, that facilitates screw-retained restorations. Mean implant survival at 1 year relative to primary stability, labial bone plate thickness with socket grafting at two reference points (L1 and L2), tooth-to-implant interproximal bone crest thickness, and pink esthetic score (PES) were evaluated. A mean insertion torque value of 65 Ncm (range 45 to 100 Ncm) was reached with the use of the tapered apical half of the implant body. No implants failed during an average healing period of 1 year. A labial plate dimension between 1.8 and 2.1 mm was attained immediately posttreatment and remained stable over time. A toothto- implant interdental bone crest distance and dimension of 2.3 to 2.6 mm was reached; it was also sustained at the 1-year follow-up. The average PES was 12.5 (range 9.0 to 14.0), with nearly 90% of treated sites with an "almost perfect" score. This macro hybrid implant in concept and design may be useful in immediate tooth replacement therapy of maxillary anterior postextraction sockets to achieve successful implant survival and esthetic outcomes, specifically labial plate and papilla preservation without midfacial or interdental tissue loss and discoloration. Alveolar ridge preservation is of great importance for successful implant therapy. This study investigated the effects of a xenogeneic tridimensional collagen matrix (CM) in conjunction with deproteinized bovine bone mineral blended with 10% collagen (DBBM-C) on the healing of 12 intact extraction sockets in the esthetic area. Cone beam computed tomograpy examinations revealed nearly stable alveolar ridge dimensions (> 90% of the ridge horizontal dimension was preserved). New bone formation of approximately 45% and adequate resorption of the grafted material were histologically observed. Thus, application of CM together with DBBM-C using minimally invasive flapless approach can preserve the original ridge volume and support bone formation, contributing to adequate bone volume for implant insertion. Nevins, Myron / Mendoza-Azpur, Gerardo / De Angelis, Nicola / Kim, David M.
This clinical investigation was performed to determine the efficacy of cyanoacrylate tissue adhesive to enhance soft and hard tissue healing of extraction wounds requiring a regenerative effort. Fourteen patients requiring a total of 25 tooth extractions were selected. Twenty sockets were treated with cyanoacrylate tissue adhesive over an exposed collagen barrier membrane without altering the mucogingival junction, while five extraction sockets were allowed to heal by the secondary healing intention as well but without tissue adhesive application. The results were evaluated with emphasis on soft tissue color and form as well as bone surface morphology. All sites received dental implants. There was a clear advantage to using cyanoacrylate tissue adhesive as a protective mechanism over an exposed collagen barrier membrane. Wise, Roger J. / Chen, Chia-Yu / Kim, David M.
Gingival hyperpigmentation in the anterior region in people with a high smile line is an esthetic concern. Gingival depigmentation can be achieved through various procedures. Most techniques have shown successful short-term results; however, recurrence is observed in 50% of patients after 2 to 4 years. A 46-yearold woman presenting with a large black zone of gingival hyperpigmentation in the anterior maxilla was treated with scalpel blade excision. At 25 years after the depigmentation procedure, the patient displayed no recurrence. Schneider, David / Sancho-Puchades, Manuel / Benic, Goran I. / Hämmerle, Christoph H. F. / Jung, Ronald E.
The objectives of this study were to compare conventional and computer-assisted implant planning and placement (CAIPP) protocols regarding surgical planning predictability, intraoperative complications, and patient-centered outcomes. Partially edentulous patients (N = 73) were randomly allocated to one of three treatment groups: control (C, n = 26), with preoperative planning based on conventional radiography and freehand implant placement; and test 1 (T1, n = 24) and test 2 (T2, n = 23), with two different CAIPP protocols. The clinicians' predictions of the bony morphology, materials needed for surgery, and surgery duration were matched with intrasurgical findings using kappa tests. Complications or deviations from the surgical or prosthetic protocol were recorded. Descriptive statistics were used to study the sample sorted out by treatment group. Differences between groups were evaluated with chi-square test for qualitative variables and with nonparametric Kruskal-Wallis test for quantitative continuous variables. For post-hoc tests, the Bonferroni corrected (P < .016 = .05/3) Mann-Whitney test was used. CAIPP protocols showed better diagnostic potential than conventional protocols for the bone topography, need for simultaneous GBR procedures, membrane selection, and implant length predictions. The rate of surgical protocol deviations was similar in all groups, but their nature differed. Conventional protocols showed fewer splint-related incidences. Implant bed preparation and insertion could not be fully completed using the surgical splint in 3.8% of patients in C (1/26), 45.8% in T1 (11/24), and 47.8% in T2 (11/23). Deviation from the initial prosthetic plan was necessary in one case (T2; 4.4%). No biologic or technical complications were observed. CAIPP protocols showed a higher diagnostic potential than conventional protocols. A high incidence of intraoperative surgical protocol modifications to adjust suboptimal implant placements was reported for every group. Therefore, strict intraoperative implant position monitoring is mandatory for both treatment protocols. The aim of this study was to examine 10 different shades of pink ceramic to determine which one best matches the mean color of human gingiva. Barshaped zirconia samples were fabricated and veneered with 1 of 10 pink zirconia veneering ceramics. The color of the gingiva at the central maxillary incisors of 20 healthy volunteers was compared to the pink veneering ceramics using a spectrophotometer (Spectroshade, MHT). The obtained color parameters L*, a*, and b* (CIELAB) of the gingiva and the ceramics were used to calculate the color difference (ΔE). Mean ΔE values were descriptively analyzed and compared to the threshold value for visibility of color differences of gingiva (ΔE = 3.1). The lowest pink ceramic ΔE value obtained (closest to the mean ΔE of all the volunteers' gingiva) was 6.2. All the tested ceramics exhibited a color difference above the threshold value for visibility. In the present clinical case, the authors report the orthodontic treatment of an adult patient with Class II malocclusion with periodontal disease and extensive bone destruction in the anterior region of the median palatine suture. Before orthodontic treatment, the patient presented precarious oral health. The treatment proposed for the case was insertion of an autogenous graft and subsequent orthodontic movement of the teeth to the area of the graft. The results obtained were correction of the malocclusion with significant improvement in gingival retraction and smile esthetics. With this clinical case, it could be concluded that well-performed orthodontic treatment can improve periodontal condition. Although implant therapy in esthetically relevant areas is currently based on a prosthetically driven philosophy, anatomical and technical factors may impair ideal implant placement. In these scenarios, the clinician is frequently asked to solve the discrepancy between the implant emergence and the ideal coronal anatomy of the final restoration. This report describes how changes of the implant abutment-crown contour in specific locations may be intentionally promoted to determine improvements of the peri-implant soft tissues and overall esthetic integration. Cobalt-chromium alloys together with computer-aided design/ computer-assisted manufacture technologies are critical factors in achieving this goal. Case reports for the mandibular anterior dentition demonstrated the ability to enhance biologic and esthetic results of malpositioned implants. The purpose of this study was to evaluate the marginal adaptation and fracture load of ceramic laminate veneers on teeth with different preparation depths. A total of 75 extracted intact human maxillary central incisors were prepared with three different preparation depths (P) and assigned to the following five groups (n = 15): P1 (0.3-mm depth of preparation; preparation entirely in enamel); P2 (0.5-mm depth of preparation; preparation in enamel and dentin complex); P3 (1-mm depth of preparation; preparation entirely in dentin); P4 (no preparation, only surface roughening); and P5 (unrestored, intact teeth as control). A total of 60 lithium disilicate laminate veneers were fabricated. The marginal adaptation of the veneers was evaluated by light microscope and scanning electron microscope after cementation with resin cement. Finally, the veneers were loaded until fracture at a 90-degree angle to the lingual surface of the tooth. Statistical analyses were performed using analysis of variance and Tukey multiple range test. There was a significant difference between the marginal gap value of the distocervical measurement points of P1 and P2 and the distal measurement points of P3 and P4 (P = .33 and P = .017, respectively). The highest fracture resistance values were observed in the P5 group (mean: 389.55 ± 22 N) and the P2 group (mean: 322.86 ± 79.38 N), and the lowest values were observed in the P3 group (mean: 219.21 ± 60.74 N). The marginal adaptation of the laminate veneer restorations was not related to the depth of preparation. Mean fracture resistance of laminate veneers with 0.5-mm preparation depth was greater than that of the 0.3-mm and 1-mm preparation depth laminate veneers and those with no preparation. The aim of this study was to compare midfacial soft tissue assessment and horizontal width changes of fresh socket implants in immediate and delayed prosthetic restorations. Patients requiring extractions in the maxillary esthetic zone were recruited. In one group, 30 implants were placed using an immediate loading approach; in the second group, 30 implants were loaded after a period of 3 months. At the 4-year follow-up, statistically significant differences (P < .001) were found. Immediate implants restored on the day of surgery demonstrated more stable midfacial soft tissue levels and bone volume maintenance than delayed implants. Moreno Rodriguez, Jose A. / Caffesse, Raúl G.
A new surgical approach has been developed to optimize the preservation of the gingival margin and papillae when treating periodontal defects. The flap is raised by one mucosal incision far away from the marginal tissues. This case series reports on the effectiveness of a nonincised surgical approach (NIPSA) in conjunction with a hydroxyapatite-based graft biomaterial and enamel matrix derivative in treating intrabony defects. Ten defects in 10 patients were treated. The follow-up period ranged from 6 to 18 months (mean: 10.8 ± 4.7 months). Probing pocket depth was 9.6 ± 2.3 mm before surgery and 2.3 ± 0.5 mm postsurgery. Clinical attachment level (CAL) decreased from 10.4 ± 2.7 mm to 3.1 ± 0.87 mm postsurgery. The gingival papilla height, keratinized tissue width, and buccal gingival margin remained stable over time. No wound dehiscence was recorded. Mean Early Healing Index was 1.5 ± 0.7. Results show a substantial CAL gain, limited postsurgical shrinkage, minimal morbidity, and early healing. This study evaluated the color variability of hues B, C, and D between the VITA Classical shade guide (Vita Zahnfabrik) and four other VITA-coded ceramic shade guides using a digital camera (Canon EOS 60D) and computer software (Adobe Photoshop CC). A cross-polarizing filter was used to standardize external light sources influencing color match. A total of 275 pictures were taken, 5 per shade tab, for 11 shades (B1, B2, B3, B4, C1, C2, C3, C4, D2, D3, and D4), from the following shade guides: VITA Classical (control); IPS e.max Ceram (Ivoclar Vivadent); IPS d.SIGN (Ivoclar Vivadent); Initial ZI (GC); and Creation CC (Creation Willi Geller). Pictures were evaluated using Adobe Photoshop CC for standardization of hue, chroma, and value between shade tabs. The VITA-coded shade guides evaluated here showed an overall unmatched shade in all their tabs when compared to the control, suggesting that shade selection should be made with the corresponding manufacturer guide of the ceramic intended for the final restoration. Torabi, Alireza / Najafi, Babak / Drew, Howard J. / Cappetta, Emil G.
Improvement of smile esthetics is a major goal of modern dentistry. Various treatment modalities have been proposed to correct excessive gingival display (EGD), depending on the identified etiologies. This study reports on the clinical and patient-centered outcomes of a novel lip repositioning technique with vestibular shallowing approach in the treatment of three types of EGD with varying etiologies. Periosteal fenestration with cicatrization (scarification) was performed at the mucogingival junction to ensure the stability of esthetic outcomes. Suspensory triangular sutures and extraoral tissue stabilization tapes were used to facilitate the cicatrization process during the healing phase of this novel technique. Postoperative clinical examination revealed 84% reduction in gingival display that remained stable for 13 to 16 months with a high level of patient satisfaction. 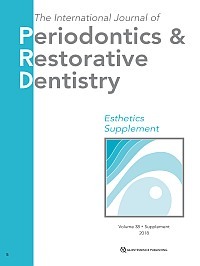 Najafi, Babak / Kheirieh, Parisa / Torabi, Alireza / Cappetta, Emil G.
Periodontal regenerative treatment of intrabony defects in the esthetic zone often poses a significant challenge to clinicians. Various materials and techniques have been proposed to achieve periodontal regeneration. This article presents modified vestibular incision subperiosteal tunnel access (M-VISTA) for treatment of intrabony defects in the esthetic zone. Two cases were treated using the proposed approach with enamel matrix derivatives and demineralized freeze-dried bone allograft to optimize the regenerative outcomes without affecting the soft tissue profile in the esthetic zone. Two different indications were described with addition of acellular dermal matrix and specific suturing techniques based on each particular clinical scenario. Clinical and radiographic follow-up of 18 months revealed successful outcomes of the proposed minimally invasive approach with no postoperative gingival recession. Patient-centered outcomes were highlighted as another major consideration in periodontal regeneration.